Annuals, 15-40 cm; taprooted or fibrous-rooted. Stems loosely white-tomentose, not glandular. Leaf blades (crowded, internodes 1-5, sometimes to 10 mm) narrowly obovate to subspatulate, 1-3(-6) cm × 2-8 mm (distal smaller, oblanceolate to narrowly oblong or linear), bases subclasping, usually decurrent 1-2 mm, margins weakly revolute, faces mostly concolor to weakly bicolor, abaxial gray-tomentose, adaxial usually gray-tomentose, sometimes glabrescent, neither glandular. Heads in terminal glomerules (1-2 cm diam.). Involucres broadly campanulate, 3-4 mm. 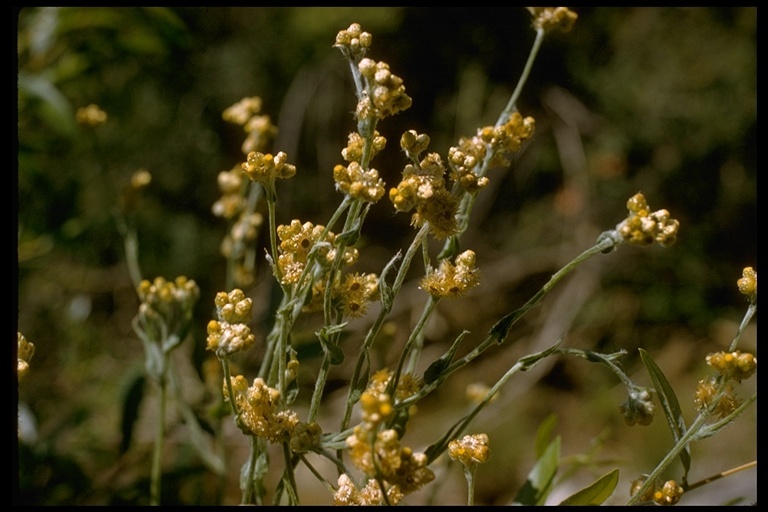 Phyllaries in 3-4 series, silvery gray to yellowish (hyaline), ovate to ovate-oblong, glabrous. 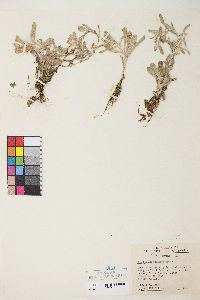 Pistillate florets 135-160. Bisexual florets 5-10 (corollas red-tipped). Cypselae not evidently ridged (conspicuously dotted with whitish, papilliform hairs; pappus bristles loosely coherent basally, released in clusters or easily fragmented rings). 2n = 14, 16, 28. Flowering Apr-Oct. Roadsides, fields and pastures, ditches, streambanks, seasonal ponds, gardens, and other disturbed sites; 5-2000 m; introduced; Ariz., Ark., Calif., Fla., La., Nev., N.Mex., N.Y., Oreg., Tex., Utah, Wash.; Mexico; Europe; Asia; Africa; Pacific Islands (New Zealand); Australia. 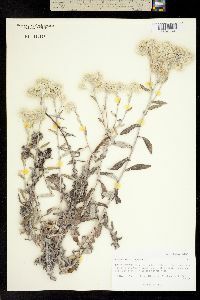 Pseudognaphalium luteoalbum is native to Eurasia. 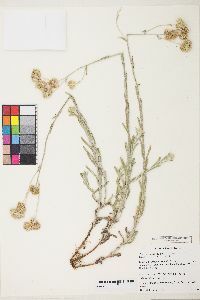 It is similar in overall habit to P. stramineum but distinctive in its larger heads and red-tipped corollas (visible through the translucent phyllaries). 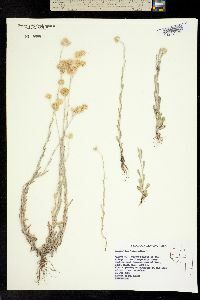 Cypselae of P. luteoalbum have papilliform hairs; cypselae of other North American species of Pseudognaphalium are glabrous. Duration: Annual Nativity: Non-Native Lifeform: Forb/Herb General: Annuals, 15-40 cm; taprooted or fibrous-rooted. Stems loosely white-tomentose, not glandular. Leaves: Leaf blades (crowded, internodes 1-5, sometimes to 10 mm) narrowly obovate to subspatulate, 1-3(-6) cm 2-8 mm (distal smaller, oblanceolate to narrowly oblong or linear), bases subclasping, usually decurrent 1-2 mm, margins weakly revolute, faces mostly concolor to weakly bicolor, abaxial gray-tomentose, adaxial usually gray-tomentose, sometimes glabrescent, neither glandular. Flowers: Heads in terminal glomerules (1-2 cm diam.). 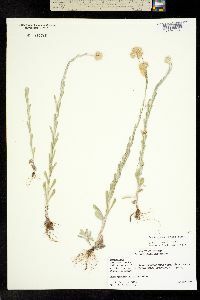 Involucres broadly campanulate, 3-4 mm. 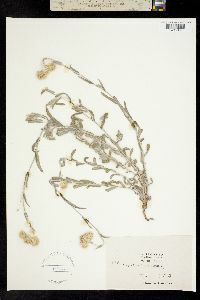 Phyllaries in 3-4 series, silvery gray to yellowish (hyaline), ovate to ovate-oblong, glabrous. 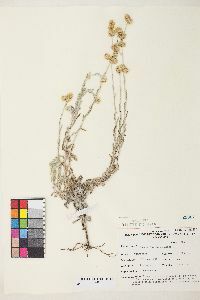 Pistillate florets 135-160. Bisexual florets 5-10 (corollas red-tipped). 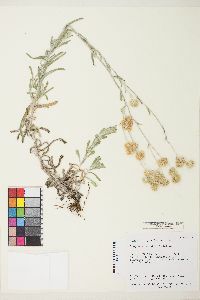 Fruits: Cypselae not evidently ridged (conspicuously dotted with whitish, papilliform hairs; pappus bristles loosely coherent basally, released in clusters or easily fragmented rings). 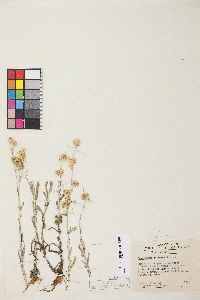 Ecology: Flowering Apr-Oct. Roadsides, fields and pastures, ditches, streambanks, seasonal ponds, gardens, and other disturbed sites; 5-2000 m; introduced Distribution: Ariz., Ark., Calif., Fla., La., Nev., N.Mex., N.Y., Oreg., Tex., Utah, Wash.; Mexico; Europe; Asia; Africa; Pacific Islands (New Zealand); Australia Notes: Pseudognaphalium luteoalbum is native to Eurasia. 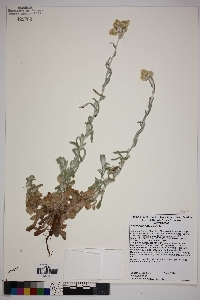 It is similar in overall habit to P. stramineum but distinctive in its larger heads and red-tipped corollas (visible through the translucent phyllaries). 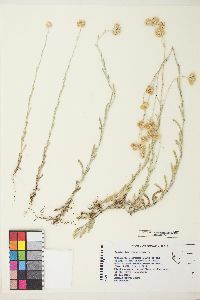 Cypselae of P. luteoalbum have papilliform hairs; cypselae of other North American species of Pseudognaphalium are glabrous.